Built in 1937, Greenside was a fine example of an early flat-roofed modern movement house, by Connell, Ward and Lucas, one of the most innovative firms of the decade. Pevsner praised the building for its ‘total design’ as opposed to a few modern ideas applied to the basic English house. The piano nobile sailed above the ground floor, and was finished with a roof terrace. The cantilevered near central stairwell dominated the front elevation and created an interesting complexity of volumes, making for an important building of great merit. It was a Grade II listed building, but in 2003 its owner demolished it without consent. He subsequently argued that the Human Rights Act justified his action. C20 Society had argued that the building could be restored, fought the owner at a public inquiry, and successfully called for his criminal prosecution. The Inspector upheld the C20 Society’s case and the owner was convicted of a criminal offence. Although the fines levied against him were small in comparison to the potential value of a cleared site in such a prestigious location (immediately adjacent to the 17th green of the Wentworth Golf Course), the sentence was an important deterrent. Critically, the Inspector recognised that listed buildings controls are not a disproportionate burden on building owners, and so dismissed the Human Rights Act defence, which would have undermined conservation. C20 Society has subsequently campaigned for more realist fines in such cases, and continue to support and publicise the growing number of examples of buildings where creature comforts and environmental performance have been upgraded effectively and sympathetically. Connell, Ward & Lucas were pioneers of the Modern Movement in the UK, and were particularly influenced by the work of Le Corbusier. 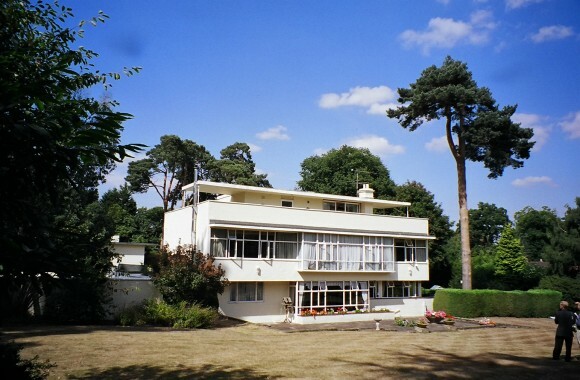 They contributed to the development of designs in concrete in this country, designing other renowned houses, namely High and Over, Amersham (Bucks), The White House, Grayswood (Surrey) and No. 66 Frognal, Camden, which are all Grade II* listed.